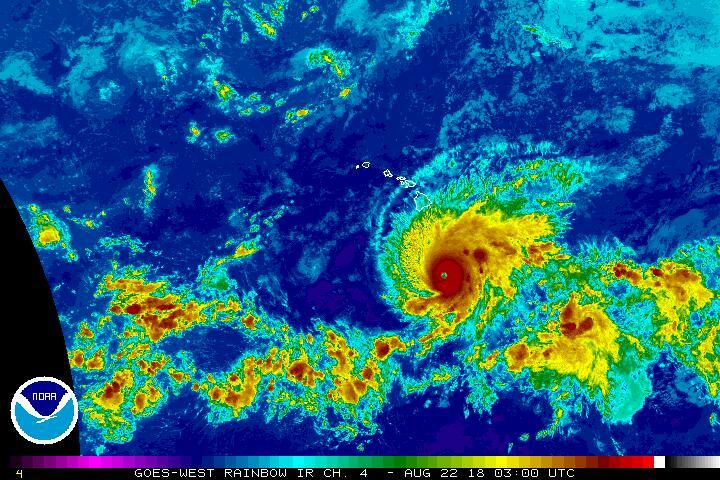 A Hurricane Warning remains in effect for Hawaiʻi County; and a Hurricane Watch remains in effect for both Maui County, and Oʻahu as Category 5 Hurricane Lane pushes onward toward the Island Chain. A Hurricane Watch means that hurricane conditions are possible within the watch area, 48 hours before the anticipated first occurrence of tropical-storm-force winds. At 11 p.m. HST on Tuesday, Aug. 21, 2018, the center of Hurricane Lane was located 350 miles S of Hilo; 360 miles SSE of Kailua-Kona; 300 miles SSE of South Point; 430 miles SSE of Hāna; 445 miles SSE of Kahului; 470 miles SSE of Kaunakakai; 450 miles SSE of Lānaʻi City; and 510 miles SSE of Honolulu (near latitude 14.7 North, longitude 154.5 West). Lane is moving toward the WNW near 9 mph and this motion is expected to continue tonight. A turn toward the NW is expected on Wednesday, followed by a turn to the NNW on Thursday. 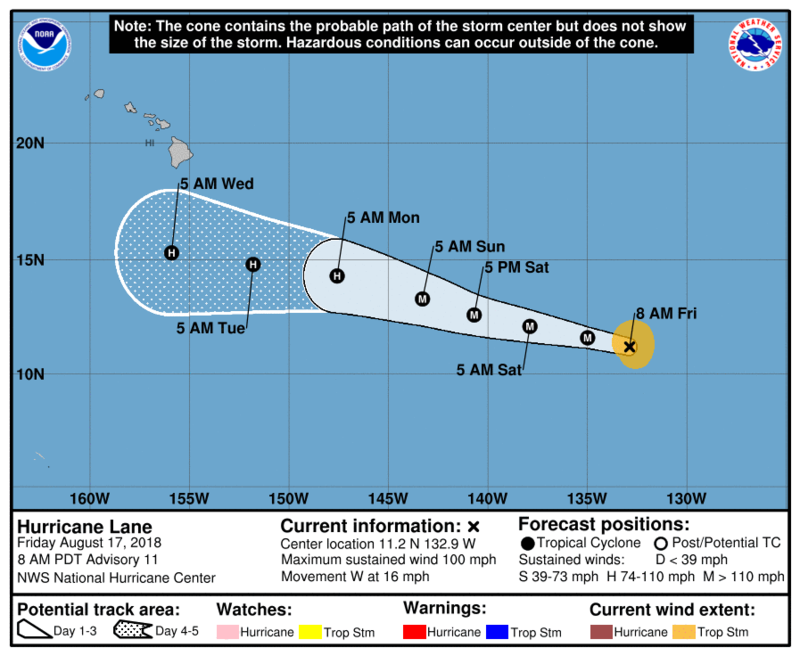 “On the forecast track, the center of Lane will move very close to or over the main Hawaiian Islands from Thursday through Saturday,” according to the Central Pacific Hurricane Center. Lane has maintained its intensity as a Category 5 hurricane with maximum sustained winds are near 160 mph with higher gusts. 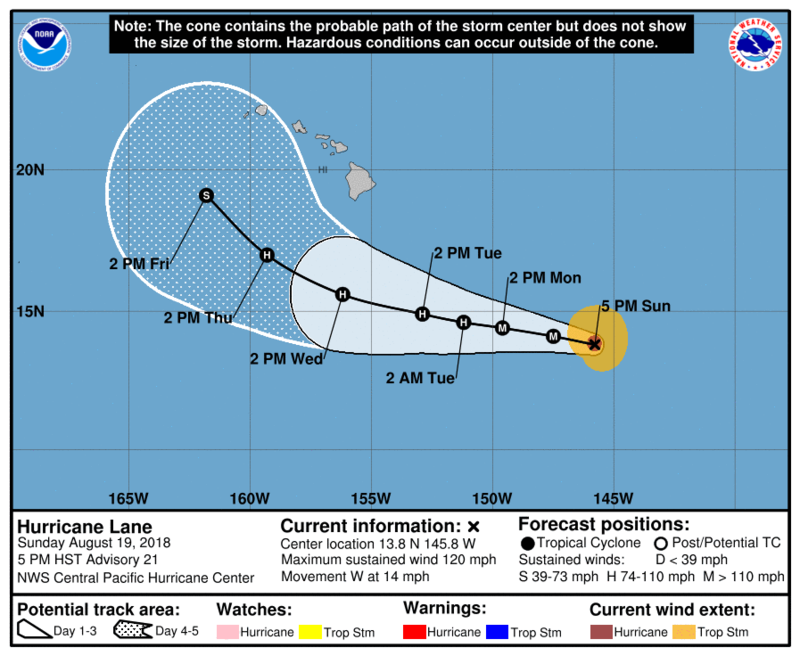 Slow weakening is forecast during the next 48 hours, but Lane is forecast to remain a dangerous hurricane as it draws closer to the Hawaiian Islands. 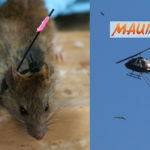 Click here for a breakdown of impacts for individual areas of Maui County. The onset of damaging tropical storm force winds on the Big Island could be as early as Wednesday evening, with dangerous hurricane force winds possible by Thursday. 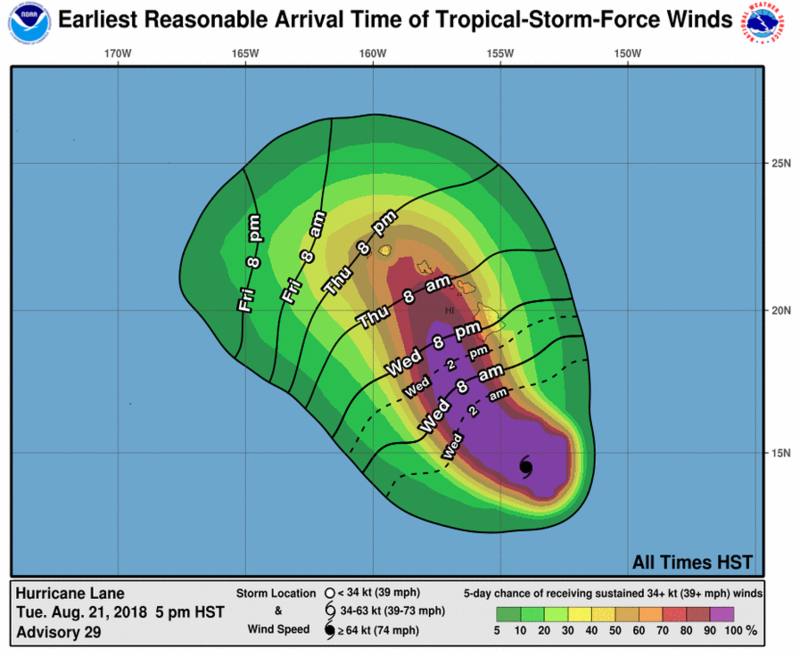 In Maui County, damaging tropical storm force winds could begin as early as Wednesday night, with dangerous hurricane force winds possible starting late Thursday. 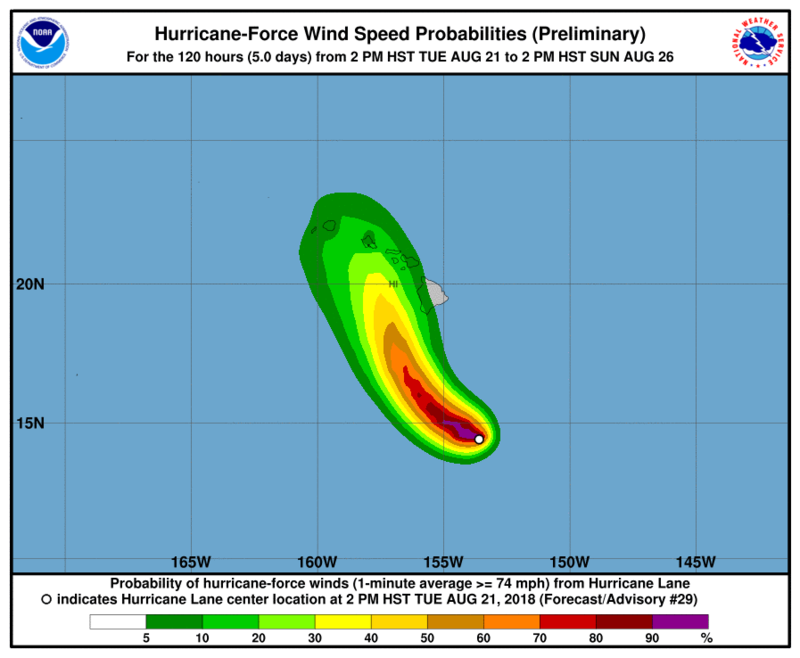 On Oʻahu, damaging tropical storm force winds could begin as early as Thursday, with dangerous hurricane force winds possible starting late Thursday night. Rainbands and thunderstorms surrounding Lane will begin to overspread the state from south to north, reaching the Big Island late tonight or Wednesday morning. Torrential rainfall is possible as squalls increase when Lane makes its closest approach, which could lead to major flash flooding, landslides and mudslides. Flooding can occur even in areas not usually prone to flooding. Storm total rainfall amounts greater than 20 inches are possible. Swell generated by Lane will bring very large and rough surf and dangerous rip currents for south and southeast facing shores. 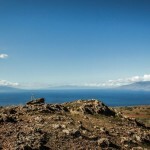 Surf heights of 15 to 25 feet could lead to ocean water surging and sweeping over beaches, coastal benches, lava flows, and roadways, creating the potential for significant damage to coastal properties and infrastructure, including roadways. Coastal evacuations and road closures are possible. Large breaking waves may affect harbor entrances and channels with damage possible to docks, piers, ramps, and boats. Tornadoes and large waterspouts will be possible as Lane approaches the islands, mainly along and to the right of the track of the hurricane on Thursday and Friday. WIND: Tropical storm conditions are expected within the Hurricane Warning area beginning late Wednesday night into early Thursday morning, with hurricane conditions expected somewhere within the warning area on Thursday. Tropical storm conditions are possible within the Hurricane Watch area beginning Thursday into Thursday night, with hurricane conditions possible late Thursday night into Friday. 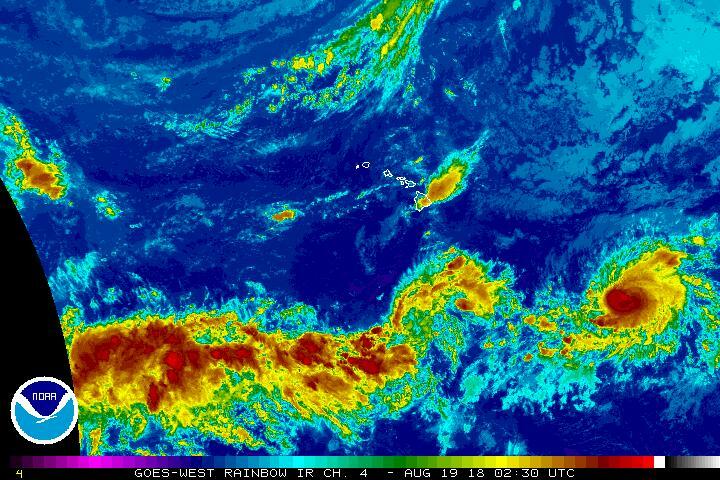 RAINFALL: Excessive rainfall associated with Lane is expected to affect portions of the Hawaiian Islands from late Wednesday into the weekend, leading to flash flooding and landslides. Lane is expected to produce total rain accumulations of 10 to 15 inches with isolated amounts greater than 20 inches over the Hawaiian Islands. SURF: Large swells generated by Lane will impact the Hawaiian Islands, beginning tonight on the Big Island, spreading across the remainder of the island chain on Wednesday. These swells will produce large and potentially damaging surf along exposed west, south and east facing shorelines. 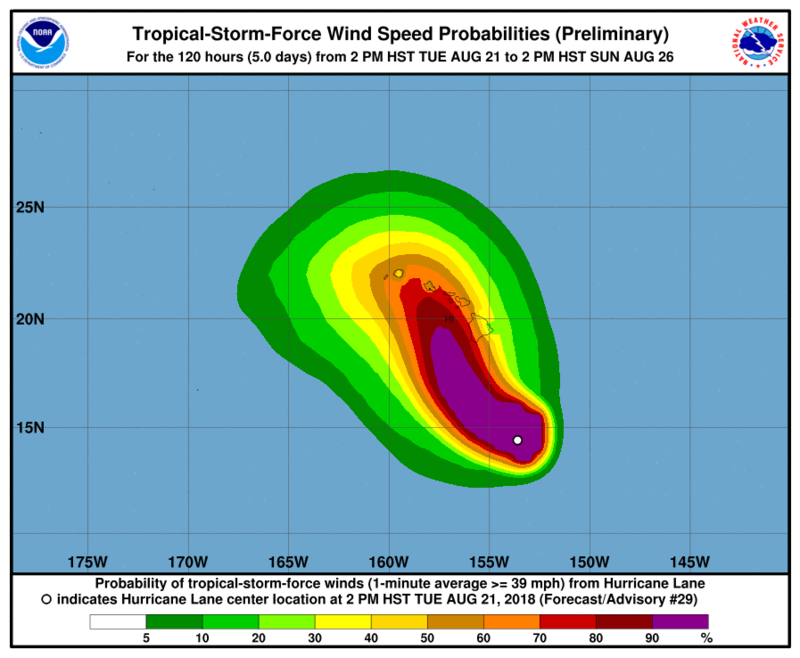 The latest long-range forecast places Lane within about 60 miles South of Kauaʻi on its closest approach on Friday night (8 p.m.), Aug. 24, as a Category 1 hurricane with maximum sustained winds near 80 mph. 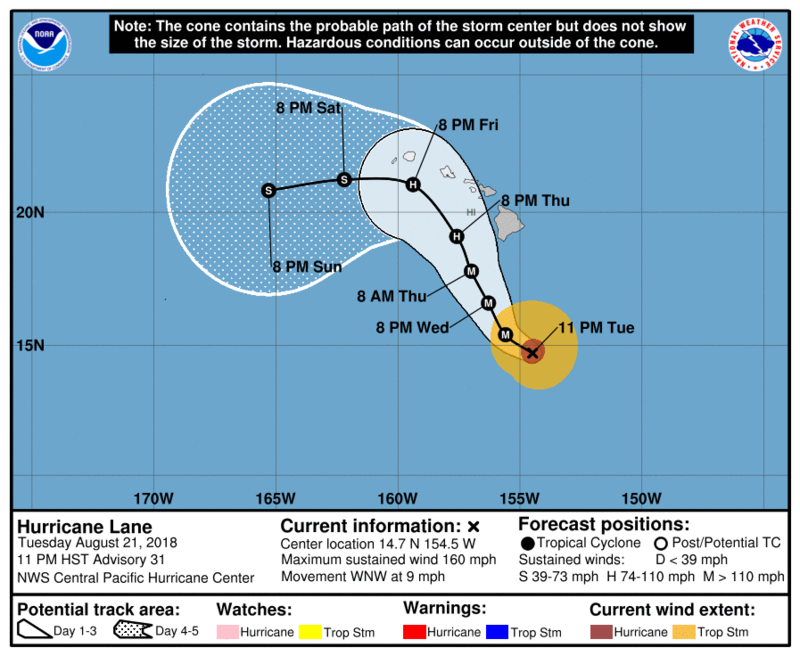 Prior to that, Lane is forecast to be about 110 miles W of South Point on the Big Island at 8 p.m. on Thursday, Aug. 23 with maximum sustained winds near 110 mph; and about 114 miles SW of the Big Island at 8 a.m. on Thursday morning with maximum sustained winds near 125 mph (Category 3).